Taking on the Field Trial Secretary job can be a daunting task, especially if you have never done this before. Following these steps should guide you through the process and ensure the required forms are filled out at the proper times. 4. Once you have received CKC approval for dates and judges, you should send a copy of the CKC Judges Panel Letter of Approval to each judge, confirming their judging assignment. A standard premium list must be published by all clubs holding Retriever field trials under these rules. A club which has been granted permission to hold a trial, and has received approval of its selected judges, must prepare and have printed a premium list with entry forms to be made available to prospective entrants. (e) Date and closing time for entries. No entries may be accepted, altered, cancelled or substituted after the official closing date and time for entries except as provided for in these rules. (f) A statement setting forth the time, date and exact place at which draw will take place. (k) The name of the Chief Executive Officer of The Canadian Kennel Club and the address of the Head Office. This information is found at http://www.ckc.ca/en/About-the-CKC/CKC-Management. At the time of distribution to prospective entrants, copies of the premium list must be sent to The Canadian Kennel Club and one copy each to the Retriever Representative and Board Member representing the zone in which the trial is to be held. Clubs are free to include other rules and regulations as they deem necessary. However, if other rules are included, they become part of the premium list and will be enforced. The trial secretary shall assume the responsibility of collecting all listing fees for the CKC, which shall be stated in the premium list. Official Complaint Form: Official Complaint Form: Print these forms and take them to the event so you have it if needed. 2. Click on Reporting System on the NRCC website under Guidelines. 3. Login using your email address and password ft@nrcc. 4. Only events that you are listed as the FT Secretary will appear. Note: Instructions appear at the top of every page to assist you in navigation. 5. Click on the Edit event information icon to verify that the stakes and dates correspond to your event. Edit as necessary. 6. Click Save at the bottom of the page to return to the List of Events page. 1. From the List of Events page, click on your event to add dogs. 2. Select the Stake from the dropdown list. 3. Click on the paw icon to Add dogs to this stake. 4. Type the dog's CKC number. If the dog exists in the database you can select it. All of the dog and owner information will automatically appear. If the CKC number is not found, or if you don’t know the CKC number, proceed to the next step and begin typing the registered name. 5. Verify pre-populated fields. If any information needs to be changed Click on the Send an email to the NRCC button. Note: The dog information cannot be edited. If any information is missing or incorrect, only the NRCC can change it. 7. Begin typing the name of the handler and select from the dropdown. Only one name can be selected as the Handler. Most importantly, indicate if the handler is a P=Pro or A=Amateur. 8. Depending on what you want to do next, either Click Save-> Add another dog or Save-> View dogs entered. 9. Dogs can also be added from the List of Events page by clicking on Add Dogs, found above the table. 1. From the List of Dogs, Handlers, Results page, select the stake you want to create or regenerate the running order. 2. Click on the Create/Regenerate Running Order command found above the table. This can be redone if you wish to change. You can also manully adjust the running order. 3. Click Save at the bottom of the page. Exporting the data to create your catalog and callback sheets. 1. From the List of Dogs, Handlers, Results page, select the stake you want to export data. 2. Click on the Export, found above the table. 3. You will be prompted to Open, Save or Cancel. Choose Open. 4. The file should open in MS Excel. 5. Select Save As - Excel 97-203 Workbook. 6. Browse to find your LFT folder you created so you can save the file to that folder. Use the default name, for example Op1.xls. You will need to do this for each stake. Important: If you need to enter a dog after you have posted your running order, DO NOT click Create/Regenerate Running Order. Simply add the dog to the stake and manually type the Running Order number for that dog. You can then click RunOrder in the Header row to sort the list numerically. You will need to re-Export the stake for your catalog. If you click Create/Regenerate Running Order, you will scramble the published Running Order. Three template files have been created for you to use to create your catalog, catalog pages, callback pages / marshal's sheets. They can be found on the NRCC website on the Forms page under Official Business. Using the templates provided is just a convenience to make production of your catalog easier. You can choose to use your own customized files and you may also opt not to create callback pages / marshal's sheets and just produce your catalog. 1. Go to the NRCC website Official Business/Download Forms, click on each template file (Catalog.doc, stake.doc, stake-callbacks.doc) and choose Save. 2. When download is complete, click Open. 3. 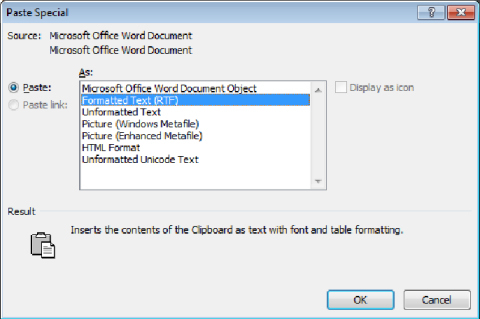 Click Save As Word 97-2003 Document and browse to place the file into your LFT folder. 4. When all template files have been saved to your LFT folder, Browse to and Open your LFT folder. 5. Double click on Stake.doc to Open. 6. 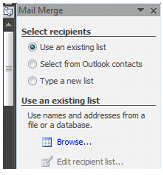 Select the Mailings tab, then Start Mail Merge - Step-by-step Mail Merge Wizard. 8. Open your LFT folder in the left hand column. Select the Excel file you want to merge to ie. Op1.xls and click Open. 9. Click OK in the next 2 dialog boxes that open. 10. Your file will open with a lot of text that probably doesn't mean much to you. 11. Select the Mailings tab if you aren't already there, and click Preview Results. You will now see the entries for Open 1 if that is the stake you are creating catalog pages for. 12. Double click in the Header and type the stake Name and Date, as indicated. 13.	Review Dog Names and reduce the font size if text wraps to a 2nd line. Delete any blank records. Be careful not to delete more lines than are necessary. 14. Click Save As Word 97-2003 Document with the name of the stake you are processing ie. Op1.doc. 16. Repeat steps 3 through 13 with Stake Callbacks.doc remembering to include the word callbacks in the file name for each stake. 17. After you have exported all of your stakes to Excel files in the LFT folder on your computer, you are now ready to create the remainder of your catalog pages, callback pages / marshal's sheets. 18. Repeat steps 3 through 13 with Stake Callbacks.doc remembering to include the word callbacks in the file name for each stake. There are a number of ways to assemble your catalog. You can assemble all of the individual Word files into one Word file, create a PDF and print the entire catalog. This is the most complicated process and requires some expertise in Word to deal with changing between 1 to 2 column pages, and section specific Headers. If you opt to assemble all of your files into 1 Word file, Catalog.doc gives you a starting point. You will need to disassociate each stake specific Word file from it's stake Excel file. Save As with a new name, such as Final Op1.doc etc. and Close file. With the Catalog file already open, you are now ready to assemble your files. Open each stake file in the order you want it to appear in your catalog. Type (Ctrl+A) to select all and Copy. Go to the end of the Catalog file and Select Paste Special. Don't forget you need to post the running orders before close of day for the TSX used to determine rotation for your trial. 1. Go to the NRCC website and click on Field Trials/Running Orders from the left side menu. 2. Follow the Forum instructions to post Running Orders. 1. From the List of Events page, click on your club name. This will take you to the List of Dogs, Handlers, Results page. 2. Select the stake for which you want to report results. 3. The Results column at the right side, allows you to Select 1, 2, 3, 4, RCM, CM, SCR (Scratch), or DNF (Did Not Finish). DNF is the default. Don’t forget to click Save at the bottom of the page. 4. Send a quick email to results@nrcc-canada.com to let us know it's done, so your results can be posted on the NRCC and Retriever Results websites. You no longer need to complete the NRCC placings form, send a marked catalog, or the National Qualifiers form to the NRCC. At the end of the trial season, 100% of the funds collected will be distributed retroactively to the National and National Amateur Host Club(s) for that year.